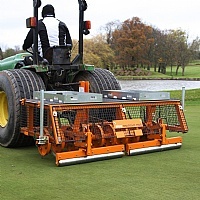 Built to last, a range of tractor mounted deep slitters for both outfield and fine turf. Different working widths and varying maximum depths allow a model to be selected to suit any tractor and most applications. These machines are simple in design and low maintenance. Their thin sharp blades cut through the turf and root zone leaving only a slit on the surface but giving deep optimum sub soil disturbance. Regular slitting encourages strong, healthy root growth of the grass plants, improving tolerance to drought conditions and promoting more rapid recovery after damage in play. 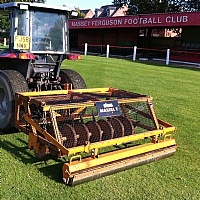 The SISIS Megaslit is a tractor mounted deep slitting lawn aerator which gives deep, clean penetration ideal for large sports field maintenance and amenities. Suitable for maintenance of golf courses, football, soccer rugby and cricket pitches, it can also be used for lawns and gardens. The Megaslit achieves maximum underground cultivation due to the angle of the tines and spiral design of tine shaft assist penetration and its simple design requires little maintenance. The SISIS Maxislit is a tractor mounted deep slitting lawn aerator for sports field maintenance, golf course maintenance and amenities, with deep, clean penetration. Suitable for maintenance of football, soccer rugby and cricket pitches and golf courses, it can also be used for lawns and gardens. The Maxislit produces outstanding underground cultivation due to the angle of the tines and spiral design of tine shaft assist penetration and its simple design requires little maintenance. The SISIS Multislit is a tractor mounted deep slitting lawn aerator for sports field maintenance, fine turf and amenities, offering deep, clean penetration with minimal surface disturbance. 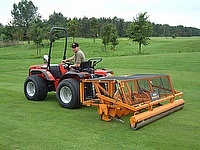 Suitable for maintenance of football, soccer rugby and cricket pitches and golf courses, it can also be used for lawns and gardens.The Multislit produces excellent underground cultivation due to the angle of the tines and spiral design of tine shaft assist penetration and its simple design requires little maintenance.